This weeks theme for 52 Ancestors in 52 Weeks is the Old Homestead. I’ve only seen one of my ancestral homes in person. I really wanted to locate the house my grandmother, Anna (Jackson) Shellabarger grew up in Oakland, California. I used Google Maps and the Oakland Interactive Planning database to fulfill my mission. 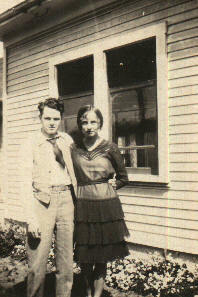 My great grandparents, Harry and Marguerite (Jones) Jackson, started their family in San Francisco, CA. Marguerite was a native and Harry made it his home around 1900 after giving up his life as a sailor. They lost their home in the 1906 earthquake and fire. 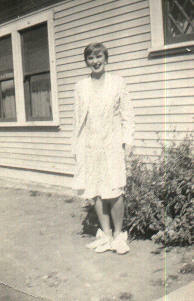 For a short time after the disaster, they lived with Marguerite’s sister, Josephine (Jones) Pohley. I am told that the Pohley’s were the only relatives whose house survived. I’ve yet to test that story. They stuck in San Francisco for a couple of years living in different locations. By 1911, they had moved across the bay to Oakland. Their first home on Peralta Avenue is no longer there. The entry in this database links to Google Maps. If I was lucky, the addresses would be visible and clear and I wouldn’t have to guess which house was the correct one. After searching the addresses on the front of the houses, I’ve determined that the peach color house is 2652 25th Avenue. The Jackson’s moved in about 1915. My grandma was 3 at the time. Harry moved out in 1926-1927 when he and Marguerite split up. Marguerite stayed until at least 1930 with her daughters, Viola and Julie. I’m guessing that she couldn’t after to live there very long after the divorce. I have very few photographs to compare to and they aren’t really great examples. My grandmother identified these three photographs as being taken at her childhood home. She was 85 and going blind. I’m not sure if her witness testimony holds up under pressure. As you can see, none of the photographs show us a front view. In those days, folks used their camera where they had sunlight. It is possible that this isn’t even their house but a neighbors! The window pane that appears in all three is not visible in any of the views on Google Maps. My assessment is the windows have been replaced. They look more modern on Google Street View. So, that doesn’t help us. The only thing that is the same is the slats that cover all sides of the house. It ends a couple feed above the flower garden. This appears to be the same in the front view where the porch steps are. 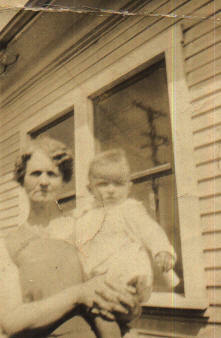 Marguerite (Jones) Jackson with her grandson, Donald Smith, 1930. My grandma in Oakland ca 1927, is this the house she grew up in? Unless another photograph surfaces showing the house from the front or I go bang on their door and ask to see the back of the house, I guess I’ll never know for sure about the house in my photographs. At least, with the help of Google Maps, I now know where my grandma grew up. I will continue looking for details about the house. I know from my Great Aunt Julie that her father tried to burn the house down during the divorce. Traumatic for them, but sure there must be some record of his crime. And, maybe there will be a photo with those records. Thank you for mentioning that Oakland Interactive Planning database – I had no idea it existed! I have Oakland ancestors also and that database should prove helpful. Leah, thanks for your comment! I only found the Oakland Interactive Planning database a few months ago. There is one for San Francisco as well. I hope you’ll find it helpful and locate the properties associated with your family.